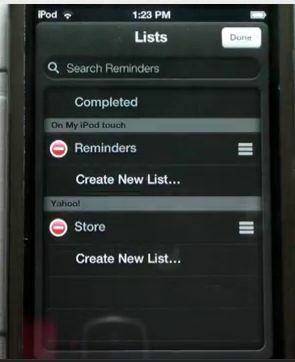 Home » iPhone Tips » iPhone Applications » How to use the iOS 5 Reminders app? With the release of the iOS 5 software update for the iPhone, iPad and iPod Touch devices getting closer and closer every single day, we though that this would be a good time to talk about one of the new apps that is expected to be released along with the update; the Reminders app. The Reminders app will do exactly what it says on the tin and will basically be a reminders application for all of the things that you might want to remember. Of course, there are currently apps like this available from the app store but there is no doubt that the Apple one will be pretty good itself. So, how do you use the iOS Reminders app? Well, when you first launch the reminders application, you will be presented with the list of default things in your list. This will probably include a few examples from Apple. From here, you can quickly and easily add another task on to the list for you to remember and you can then enter all of the details about your reminder. You will be able to enter information on the date, time, title, location, priority and much more. There will be alarms within the app which is why you will need a time for your reminder. Overall, the Reminders app looks pretty good so far and is really easy to use. It looks like another great addition to the iPhone from Apple.